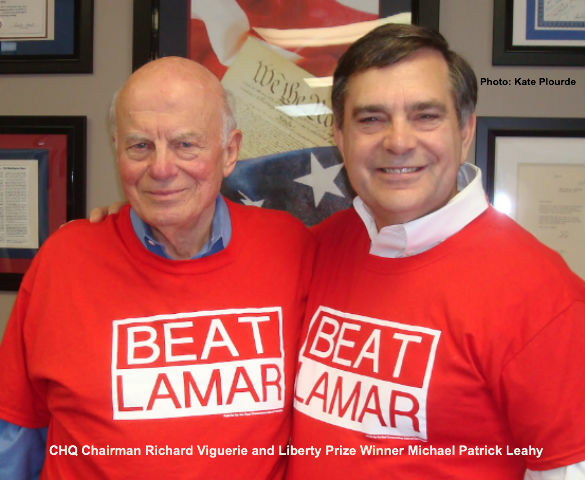 Richard Viguerie, Chairman of ConservativeHQ.com and donor of the Liberty Prize – a $10,000 prize fund for the best plan for conservatives to take over the Republican Party and govern America in 2017 – today announced that “Real Conservatives National Committee” and Dan Schultz, Phoenix, Arizona author of “Taking Back Your Government: The Neighborhood Precinct Committeeman Strategy” had taken the top prize and each would receive a grant of $5,000. “The Real Conservatives National Committee has already begun to implement the plan they submitted; they are training grassroots activists and working to recruit limited government constitutional conservatives to challenge Big Government establishment Republicans, like Tennessee Senator Lamar Alexander, in Republican primary elections,” noted Viguerie. “In response to the Liberty Prize challenge we received over 1,000 entries and ideas. The vast majority of the comments and submissions dwelt upon the sad state of the establishment Republican Party. While those submissions provided a useful commentary on why conservatives must rally their energies to take over the GOP, they did not help us find a path forward. The Real Conservatives National Committee and Dan Schultz contributed specific ideas and strategies that, if implemented at the grassroots level, will help us achieve the goals of conservatives taking over the Republican Party and governing America in 2017 – and in the process saving our country and preserving American exceptionalism for future generations. I'm honored to include their ideas in my upcoming book TAKEOVER and to award them the Liberty Prize,” concluded Mr. Viguerie. Where do we get our hands on it? Submitted by elmer2flp on Thu, 08/29/2013 - 17:30. We precinct workers would love to see this winning entry ASAP. Where can we read it? Submitted by Stephen.herman on Tue, 08/27/2013 - 13:11. That's kinda the point. The establishment Republicans do not want to get conservatives elected. They are the party of Teddy Roosevelt, the original German influenced "Progressive", leadership wing of the party. The conservatives have never been welcome in the Republican party, they have been a necessary evil for Republicans to hold power. Submitted by wjwynne on Tue, 08/27/2013 - 00:22. ... but the grassroots conservative base of the GOP also needs 21st century technology that beats what the liberals have been using nationally since 2007. They have the dynamic, unified database of NGP/VAN or VoteBuilder. What do we have? GOP Data Center, Political Gravity, Ground Game by Moonshadow Mobile and other static one-off systems where those other than the grassroots have control of the ALL IMPORTANT data! Then there are the myriad CON-sultants like Karl Rove who don't give a fat rat's arse about electing conservatives. Submitted by rwm52 on Mon, 08/26/2013 - 17:53. Dan has done more than anyone I know in recent history to get people involved in taking back our government. He has a proven record of results, and if the GOP is interested in electing conservatives and winning elections, they'd be smart to listen to him.